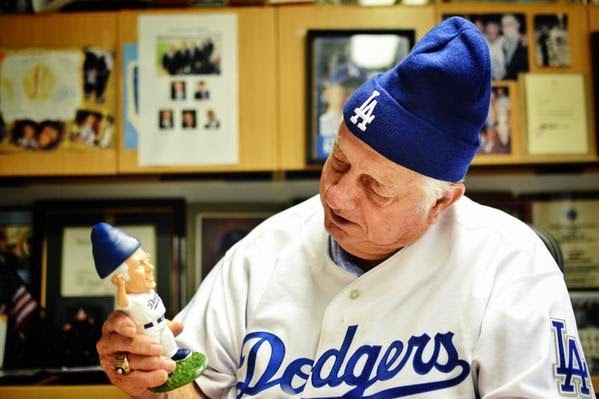 The Dodgers are finally bringing the gnome to Los Angeles. This coming Monday, May 25th the Dodgers will be giving every fan in attendance a Tommy Lasorda garden gnome - a first for the franchise. Check out what it'll look like in the photo above, pic via @Dodgers in twitter. Also, at the very bottom of this post is a instagram gif of the Lasorda gnome running around Dodger Stadium. Via Mark Saxon at ESPNLosAngeles.com, "Commissioner staying out of Dodgers TV dispute." Boo! At this point I think it's fair to say that they are no closer to a resolution then they were last season. Via Bobby DeMuro at CaliSportsNews.com, "Making The Team: Two Dodgers Non-Roster Invitees To Watch." Via Ben Badler at Baseball America, "Hector Olivera Shines At Final Showcase." Olivera looked like a man among boys. To some degree, that literally was true, since there were several teenagers on the field. Yet there were also several Cuban players in their mid-20s and even 30s on the field, and the difference between Olivera and everyone else was striking.